NICHOLSON, Morley (Mort) Roderick. Morley passed away on March 27, 2016 in his 82nd year. He is mourned by his wife, Joan of 58 years, daughter Kelly Chesson (Mike) and son Rae (Janette) and his grandchildren Katie, Matthew, Cole and Dayna who adored their "Papa". He will be sadly missed by his brothers Sherman (Shirley) and Rod (Faye). Predeceased by his brothers Gordon (Marilyn) and Orland (Barb). Mort was blessed with a loving and close knit family and was devoted to them. 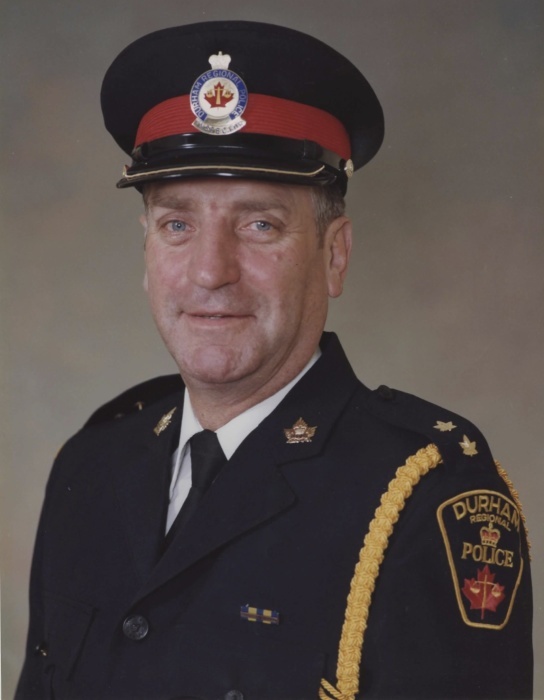 He spent 35 years on the Durham Regional Police force carrying out his responsibilities with compassion and integrity. Once he retired from policing, Mort and Joan retired to their cottage property on Washburn Island, Little Britain where they maintained lifelong friendships with neighbours who became their extended family. Mort was a ruthless card player with a passion for a good game of crib at the picnic table during summer months and cheated at euchre by winking and kicking his partners under the table. All who knew him were treated to his colourful and political views and opinions on everything from the Toronto Maple Leafs to the state of young people today. Mort was a man of great character and will be remembered for his love of family and his unpretentiousness and humility. These qualities will continue to guide and inspire us. Visitation will be held at Lakeland Funeral & Cremation Centre, Lindsay ON on Friday April 1st from 2:00pm to 4:00pm and from 7:00pm to 9:00pm and on Saturday April 2nd from 1:00pm to 2:00pm. A funeral service will follow on Saturday at 2:00pm. The family wishes to express their deepest gratitude to the devoted doctors, nurses and staff at Ross Memorial Hospital for their gracious care, attention and support. Donations to the Ross Memorial Hospital, Palliative Care Unit in Mort’s memory would be greatly appreciated.